Following the meeting in the sailing club and other discussions, the importance to Nairnshire of its river, the harbour and beaches is more fully understood and is in need of thoughtful actions. If we start with the River Nairn, it is virtually unspoiled by development on its banks. The trees and flood plain are like a Canadian wilderness. We must protect this wonderful ecology and quietness. The gravel extraction for McDermott’s and some of the river stone placements have not helped. No more gravel extraction from river bed. No extra pollution/storm water to be directed into River Nairn from future developments. Massive tourist and leisure potential. Sailing club, Kayak club both see great benefits from development of harbour area. Harbour in urgent need of repair /rebuild. If nothing is done it will disappear. New harbour design with deep water outer harbour to allow for bigger marina/touring Scandinavian / German boats. HIE/Coastal/Fishing /Harbour money to buy capacity to get this done. Professional engineering and architect input. We recently announced our Annual General Meeting to be held on the 29th Oct, 7.30pm in the Community & Arts Centre. There are some key issues on the agenda and we encourage as many of our 1000+ members as possible to attend. Around a year ago we were delighted that Highland Council declared their intention to work in partnership with us in the development of the Old Social Work Building. A valuation was sought and a price for its purchase agreed. However, our plans to work with an anchor tenant fell through at the last minute. We were therefore unable to submit our offer to buy within the alloted timetable. An extension to that timetable was refused and as a result we have struggled to fully understand what Highland Council meant by partnership working. 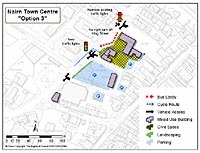 In all our discussion around town centre development with Highland Council and other town centre stakeholders, especially during the specially convened Charrette, there was general agreement on the way forward. Through the NICE survey many local residents also fed their ideas into the debate. The big issue to be faced – as it always has- is how to convert these ideas into practical outcomes. We have yet to find a mechanism for working in partnership and it is increasingly clear that doing so is complex. We now recognise that whatever Highland Council agree, it is important that our local elected representatives also support partnership working. We believe that the only way to make progress on the OSWB and town centre development in general is to sit round the table with our four local councillors and draw up an agreed agenda. This we have now agreed to do before the AGM. As a Community Development Trust we can bring certain things to the table that the local authority cannot so it makes perfect sense to work together. We look forward to our meeting and hope we’ll be able to define a use for the OSWB that will see it used for the benefit of the community. 7 RESOLUTION to add postcodes IV2 7PJ and IV2 7SQ to Appendix 1 of the Company’s Articles. 8 Proposal to work with Nairn Citizen’s Advice Bureau for joint use of the Old Social Work Building. 9 Proposal to establish a subsidiary company to deliver the Sandown Park & Wetlands Project. 10 Discussion of “Developing a Partnership Approach” with Highland Council in relation to the recent Charrette for the Town Centre. Agenda items 8 – 10 are particularly important, and Members are encouraged to appoint a proxy to vote on their behalf if they are unable to attend in person. The appointment of a proxy should be made using this form – AGM PROXY2014 and be received by the Company Secretary by 7.30 pm on 27th October 2014. Introduction: Highland Council is planning to hold a mini-Charrette event in Nairn that will have a clear focus on identifying the mechanisms for delivering and funding projects that will best deliver town centre regeneration. This proposal is made by The Highland Council in partnership with a number of interested parties, including Community Councils and business groups in each town and plan to work closely with these groups to maximise the involvement of everyone concerned. The town centre regeneration project will focus on Nairn town centre but will extend to include consideration of its relationship to other important parts of the town including the harbour, The Links, former farmer’s show field and future development areas. It also needs to address wider transport connections and the accessibility of shops and community facilities and services. It will form a consolidated plan for embracing change, delivering town centre regeneration and improvement and the integration of growth areas in the town. As one of the partners in this consultation the directors of NICE invite the community to participate in this consultation exercise to express what they want the Town Centre to deliver in terms of services and facilities. This is within the area defined by Highland Council as NA7, bounded by the A96, the High St and Leopold St. However, alongside Highland Council, we do not wish to exclude adjacent areas such as the Harbour from consideration and we have prepared the survey questions with this in mind. Please be mindful of what NICE perceives to be the overall objective – the regeneration of Nairn, more local residents, more employment in Nairn and more visitors. This consultation is ultimately about the community’s shared vision for Nairn and not at this early stage about how that is funded or achieved. We believe Nairn has a unique opportunity given that the Town Centre area is effectively an empty open space at present. In short, we have to plan for the future and the opportunity is there for us to be radical. So, tell us what you think. For goodness sake do something! A Visitor Information & Orientation Centre is essential to attracting more visitors to stop in Nairn. Update: With regard to the Old Social Work Building we hope very soon to bring forward firm proposals for consideration by members. It is important that local views are heard and we urge everyone who has an interest in Nairn’s future to complete the survey. NICE grew out of public meetings held originally in the Sailing Club. It returned to that venue once more last night (11th Nov) to meet with members of the Kayak Club, the Sailing Club, harbour representatives and two Highland Councillors, Colin and Michael. The Kayak Club and the Sailing Club outlined the potential of their activities and they both see Nairn as playing a key role in being an Olympic pathway for these sports. The following serves to explain and underscore why NICE was formed. Some question our motives but there is nothing sinister about it – it is Government policy to give communities more say and more local control. The Minister for Local Government and Planning, Derek Mackay, today (6th Nov) launched a consultation on the Community Empowerment (Scotland) Bill. The aim of the Bill is to make the most of the talents that exist in our communities; deliver high quality and improving public services; and support strong local democracy and local decision-making. • new powers for local authorities to create local business rate relief schemes. We are also inviting views on other ways to reflect local democracy principles, and considering how communities might benefit from legislation to strengthen the national and local focus on improving outcomes, currently implemented through Scotland Performs. The consultation paper is available on the Scottish Government website at http://www.scotland.gov.uk/Consultations/Current If you would like a printed copy, please contact Community.Empowerment@scotland.gsi.gov.uk, or telephone 0131 244 0382. The closing date for responses is 24 January 2014. This consultation takes forward proposals that were supported in our previous, exploratory consultation, and other issues which have emerged from further discussion with stakeholders. We are contacting people who responded to that earlier consultation, and others who have expressed an interest in the issues covered, to make sure you have the chance to comment on our detailed proposals. http://www.scotland.gov.uk/Topics/People/engage or follow us on Twitter, @CommEmpower, to keep up with what’s happening. We are pleased to publish an email concerning efforts in Forres to have Common Good Asset control returned to Community Councils. Something amazing happened last week! It became clear that this was not just a local issue and much bigger than our own local Battle for Bogton. Yes, we are still fighting our local authority who seem to be intent on selling off our beautiful park owned by us to a major property developer to build a shopping mall (which we feel will kill our high street and destroy the character of our town). We realise now that we need to keep growing this petition and take it to the UK parliament for those living in England who are equally affected. Thank YOU for helping make this happen. You are more powerful than ypu realise! If you haven’t already done so, please share the link above on your social network site and encourage your friends to do the same. Together we are many and we must be heard. Lets see this petition really rocket! for The Battle for Bogton, Forres. The Chair of NICE, Dr Alastair Noble shares his personal perspective on local Nairn issues in this series of videos published on the Gurn – a local Nairn blog. Members are encouraged to appoint a proxy to vote on their behalf if they are unable to attend in person. The appointment of a proxy should be made using this form – AGM PROXY FORM and should be received by the Company Secretary by 7.30 pm on 5 August 2013. The Feasibility Study Report will also be available on the company’s website on or before 31 July 2013. DATED this 20th day of July 2013.